If I had to choose the piece in my closet that gets the least amount of love, I'd have to go with the maxi dress. My collection of long flowy dresses tend to see the light of day when I have a wedding to attend, and that's about it. For someone who doesn't wear heels a whole lot, I used to feel like this meant long dresses were out too. But as sneakers have become the de facto footwear choice for the fashion crowd, styling your sophisticated dress with a pair of fashion-forward trainers has become an unexpectedly cool choice. The sporty shoes balance out feminine dresses without looking too casual. To prove it, we turned to a handful of our favourite style stars who have made the combination work for them. Read on for major inspiration, and to shop the stylish combo. Balance out a feminine floral dress with a pair of sporty sneakers. 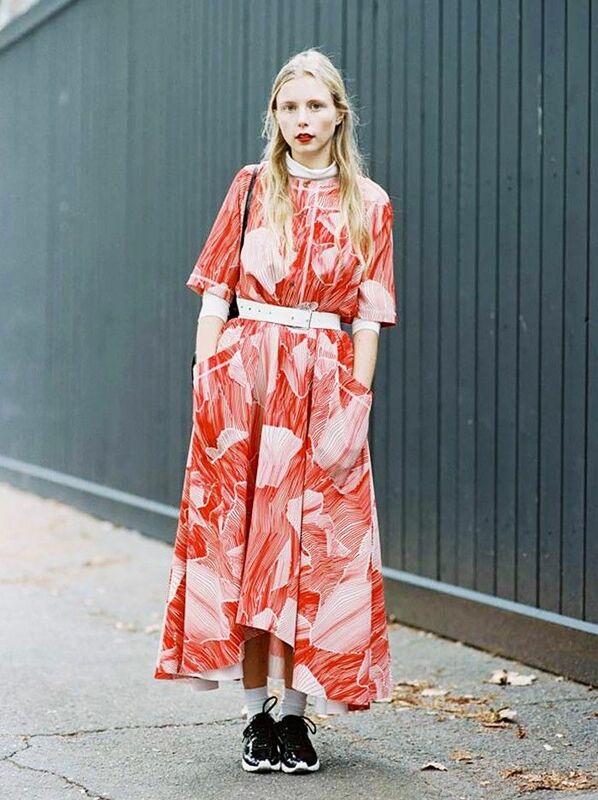 A dress with a busy graphic print is ideal for styling with a simple pair of white trainers. Take advantage of a dress with a high-low hemline and show off a pair of fancy kicks. With a simple pair of lace-ups, all eyes are on this statement dress. A classic pair of sneakers, like Converse, can easily be styled with any dress, from feminine to sporty. A fitted slip dress becomes daytime-appropriate with the simple addition of oversized statement sneakers. Don't be afraid to play with colours when deciding what to wear. Bohemian, flowing dresses are perfectly paired with sleek, low-key sneakers. Try styling this simple slip dress with old-school classics like Vans. A slip dress adds instant sophistication to these skater shoes. An ultra-feminine dress feels a little less dressy styled with sleek high-tops. Ruffles, lace, and girly details pair well with these straightforward shoes. A wedding-guest dress can transform into an ideal look for Sunday brunch by adding a trendy pair of trainers. High-fashion sneakers still feel polished enough to work with a fancy dress. Let a graphic dress be the focal point of a look by styling it with white shoes. A pair of sleek sneakers doesn't have to be boring; details like raffia add a hint of intrigue. If you're wearing a simple slip dress, choose fun sneakers that deserve a little attention. Statement sneakers are best paired with a long dress that keeps things simple. Dress down a more formal look with a pair of super-sporty sneakers. Fashionable sport sneakers help balance out ultra-feminine maxi dresses. Need something a little fancier than sneakers? The cult Kurt Geiger shoes even Karlie Kloss owns.